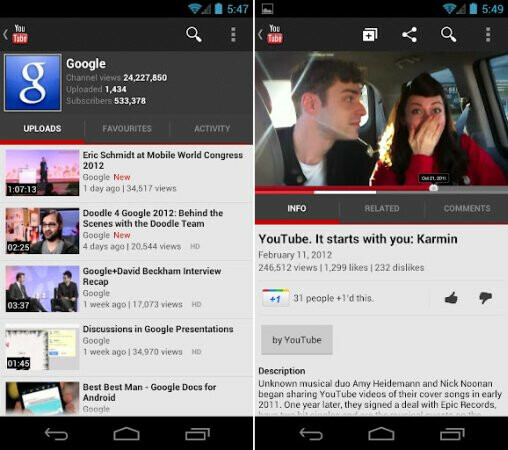 YouTube on Android 3.0 and 4.0 devices with a HD screen is a different experience than on an average Android powered smartphone. But with some Android handsets now offering displays with 720p, it is time for YouTube fans to get a clearer look at what they are watching (which hopefully is our reviews!). Anyway, if you have an Android smartphone running Android 2.2 or 2.3 with an HD screen, head over to "My Apps" and see if you have an update for YouTube waiting for you. Remember that the update is based on your phone's resolution and screen size and for some models that qualify for the update, there is a quirk that won't let you install the update from the Android Market. Still, this seems to be an important download to try to get because for some YouTube fans who have been having buffering difficulties when watching the streaming videos over 3G, some are claiming that this update has eliminated this lag. 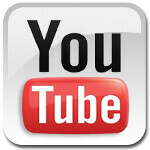 Let us know if you have been able to install the YouTube update and what changes you have noticed, if any. You can give us all of those details in the comment box below, and if you don't mind spending an extra minute or so, let us know which device you are currently sporting. The future is HD so no doubt as technology move on. HD will be the standard. The YouTube app on my Galaxy S2 does not fill every pixel when watching videos, it is slightly blurry, and it is the same on the YouTube mobile site. However, when I watch videos using the desktop YouTube site on my Galaxy S2, videos are pinsharp and every pixel is used. This is because you can choose what resolution you want the video to be. The app and mobile site fails to provide this, causing videos to be played in 360p - and this is on HQ mode! YouTube 2.4.4 version works smoothly on my Galaxy Tab 7.0 P1000 running GB 2.3.3 with the new HD mode appearing on HD video. But doesnt seem to work on my LG Op Black GB 2.3.4 and Sony X-Play GB 2.3.4 even though with the same YT 2.4.4 version updated when playing the same mentioned video.....the old HQ mode remains.